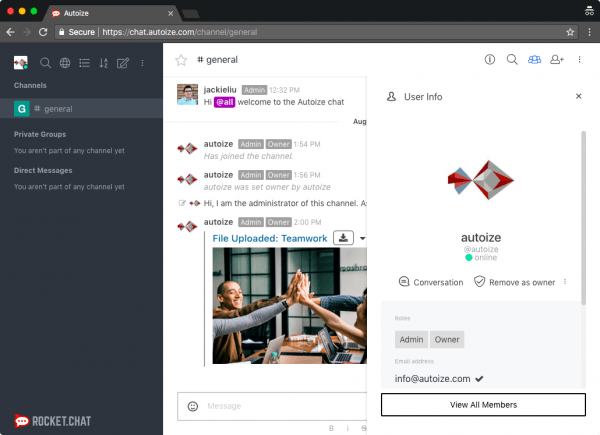 RocketChat is a chat server that makes communication between the people in your organization significantly easier with public/private channels, private messages, screen sharing, file sharing and video conferencing. RocketChat is as easy to use as a personal instant messaging apps such as Skype, but your organization’s conversations stay strictly private on your own server. Even if your corporate security policy does not allow IRC, RocketChat will work because it is a Meteor application that runs over HTTPS. There are no limitations how much chat history you can retain, unlike Slack which charges per-user if you need more than the 10,000 most recent messages to be searchable. RocketChat is a venture backed open source project that has received $5 Million in Series A funding led by New Enterprise Associates. It has received awards and accolades including recognition among Black Duck Software’s 2015 Open Source Rookies of the Year and InfoWorld’s Bossie Awards 2016.